A Constant Reader recently sent me a gift card with instructions to use it to buy this book. I guess he thought that as a fan of Z movies and insider conspiracies, it would be right up my alley. And, he was right — up to a point. For once, the cover blurb is accurate, and really says it all: “Rux posits that the film industry has long collaborated with a government disinformation campaign about UFOs.” At this point, you may very well stop reading, either the book cover or this review. But that would be a mistake — well, at least about the book. Rux starts things off with a 67-page “Introduction” that is really a mini-history of the modern “alien” mythos: flying saucers, abductions, hollow Earth, alien technology, ancient astronauts, faces on Mars, the whole shebang. The average reader, such as myself, will find this a great resource, adding many themes and details to what we’ve already heard about, and putting the whole thing into a chronological, inter-related whole. “Correlating our knowledge,” as it were. He also brings in most of the political conspiratorial matters as well: MK-Ultra, lone gunmen, etc. The relevance of the later is soon revealed in his basic thesis: Hollywood’s science fiction output (movies and TV) has been covertly directed by the intelligence community as a massive disinformation campaign, intended to debunk UFOlogy by associating it with at best fantastical, at worst deliberately bad films. Of course, one might respond with a simpler theory: as noted sci/fi writer Theodore Sturgeon famously (or supposedly ) remarked, 90% of everything is crap. This is where the Introduction makes its most important contribution: Rux shows that Hollywood movies, from workman-like B programmers such as The Thing from Another World to prestige productions like The Day the Earth Stood Still, and even, or especially, bottom of the barrel, poverty-row efforts like Plan Nine from Outer Space, are informed by precise, detailed knowledge of UFO phenomena years and sometime decades before it became publicly available. Along the way, Rux makes one especially interesting correlation: under Republican administrations, aliens are portrayed as hostile; under Democrats, they are friendly. But under Clinton (the book came out in 1998), the correlation breaks down: the evil aliens of the Reagan and Bush admins continue, which (I would add) itself correlates with the overall “neo-liberal” policies shared by the Republicans and “Clinton Democrats,” the Bush and Clinton dynasties, leading to the mass dissatisfaction of the Sanders and Trump movements today. Of course, there could be other factors; I recall several people suggesting that the alien disintegration of the White House and death of the First Lady in Independence Day was exactly what audiences wanted to happen to the Clintons. It sounds like it should be a great ride, but not so much. What really sinks the book, judged on its own merits, are a couple of rookie mistakes (if I may be pardoned for putting on my author hat and getting up on my high horse). First, with such a massive amount of material – 700 pages as it is! – Rux or his publishers decided to save trees from death and wrists from carpal tunnel syndrome by not including any more references than the bare legal requirements of attributing quotes to published sources. Otherwise, bupkis. The whole damn book is just Mr. Rux’s word, contra, if need be, mundum. This is especially true of his rather Kevin Bacony method of “proving” an intelligence connection by asserting some vague link, such as serving in the Army, or having a brother who did so. As critics have said about such reasoning in books about the ’60s: you know, there was a reason so many hippies, counterculture gurus and rockers had parents in the Army: World War II. And once Rux makes such a connection, anything produced by that studio or helmed by that director is presumed to be all spooked up. Now, I think I can see their notion. In this modern world, what will Google and Netflix and YouTube, both the UFO encounter mythos and Hollywood films, from epic blockbusters to the most obscure Grade-Z efforts (Coleman Francis! ), can be accessed on one’s laptop so as to check out Mr. Rux’s declarations. I stopped counting them, so I can’t really corroborate that number, but there sure are a lot of mistakes. For example, it’s clear that his understanding of Ed Wood’s Plan Nine from Outer Space is based on the factual “inaccuracies” put out by the Medveds and perpetuated by their epigones and clones of the “Worst Movie of All Time” cult. For example, Rux makes a lot about the incoherence of Wood’s exposition and dialogue, having especial fun with Criswell’s introduction, as contrasted with the letter-perfect speech Jeff (Gregory Walcott) later gives his wife; since the latter reproduces memes from actual pilot reports, before they became common knowledge, he adduces this as evidence of spook contributions. Jeff: It was shaped like a huge cigar. Dan saw it too. When it passed over, the whole compartment lighted up with a blinding glare. Then there was a tremendous wind that practically knocked us off our course. Paula: Well did you report it? Jeff: Yeah, radioed in immediately and they said well keep it quiet until you land. Then as soon as we landed, big army brass grabbed us and made us swear to secrecy about the whole thing. Oh, it burns me up. These things have been seen for years. They’re here, it’s a fact. And the public oughta know about it. Paula: There must be something more you can do about it. Jeff: Oh no there isn’t. Oh, but what’s the point of making a fuss. Last night I saw a flying object that couldn’t possibly have been from this planet. But I can’t say a word. I’m muzzled by army brass! I can’t even admit I saw the thing! Rux is on to something here, since, as he points out, Wood obviously knows the UFOs he painstakingly assembled from model kits are “flying saucers” not cigars. But Rux is also obviously working from transcripts or reviews; Walcott’s actual speech is mucked up by his rather thick Texas accent, and makes “They’re here” sound like “They HE-ah,” clear enough for the MST3k guys to repeat it for a few chuckles. Actors blowing lines is common enough in Wood films, but if the speech was so all-fired important couldn’t Ed have abandoned his one-take policy just once, or maybe overdubbed it later? It’s not like Ed cared about continuity. Or did he? Ed’s peculiar take on human speech, as well as he famous “goofs” and “mistakes,” are less products of incompetence against which the merely competent parts stand out as evidence of a conspiracy, than they are carefully chosen methods for realizing a unique cinematic vision. It’s a shame Rux makes his treatment of Ed so unreliable, because Ed Wood, patriotic conservative, ex-Marine, enthusiastic but easily bamboozled small town naif and an alcoholic con-man all in one, is, as the author notes, exactly the sort of person the spooks would chose to work through. Before getting back to Wood, and indeed getting into what redeems the book, I have one more bone to pick: the Index. In another rookie mistake, the writer or publisher has decided to make up for the lack of academic apparatus in the text by at least compiling an index — which all too many books today lack (though not Counter-Currents books!) — but then blotting their page by going too far. The Index is organized, if I can use that word, by various categories, which might have been presented separately (as in academic books with indices for names, subjects, Greek words, etc.) or at least given some distinctive typographical presentation. Here, not. I have never seen an index like this, and frankly, it’s impossible to find anything in it. One looks for Plan Nine, say, and one must first find the “Movies” section; or is it “Films” or “Cinema,” which would be dozens of pages in another direction, each page of which must be minutely examined to find the heading, since one can’t tell how many dozens of more or less arbitrary categories will crop up between M and F or C. Although one can scan it to find random people and things, using it in the normal fashion, to find a specific entry, is impossible. Having done a bit of indexing myself, I can assure you that at some point there was a simple alphabetical list of names, which the author or editors then went to town on, producing, God bless their little hearts, this over-organized to a fare-thee-well mess. Perhaps a flaw in the conspiratorial-minded brain? Speaking of such Aspergy intensity recalls to my own mind that I was supposed to tell you what’s good about this book, where it’s all right. The positive side is that this guy covers everything, and he brings the kind of obsessed fan attentiveness to it that allows him to come up with fascinating interpretations not unlike those produced by my own paranoiac-critical method. Not always, but enough times to make you keep going. You might say that rather than devoting obsessive attention to repeated screenings of favored works, he’s devoted the same intensity to simply viewing (or claiming to view) everything. Quantity, not quality, but at times it works. For example, what won me over was his treatment of The Rocky Horror Picture Show. Yes, really, that movie. It beautifully illustrates his thesis of the premature awareness of UFO facts, since, since when repeatedly viewed with Rux’s kind of obsessive attention to detail, it emerges as a more or less straightforward and complete alien abduction narrative, but filmed, written, even performed onstage two or three years before the classic abduction stories became known to the mainstream media. Frankly (ha!) I’d never really thought of it as a particularly “hard” sci/fi film, rather than a campy sendup of ’50s schlock, but as Rux piles up the details and correlates them to abduction accounts, the gestalt image shifts, the 3D image appears, and suddenly you realize that he’s all right! Eventually, Rux even ropes in the Biblical account of the Fall of the Watchers, a popular “ancient aliens” meme that, I would add, links Dr. Frank-n-furter to the race of Heroes discussed in Part One of Evola’s Hermetic Tradition. Not everything rises to this level, but enough does (such as the analysis of Night of the Blood Beast by Roger Corman — another CIA spook, of course) to keep the reader paging through this almost endless survey of Hollywood schlock. As an added bonus Rux’s definition of “Hollywood” includes major foreign producers (such as UK’s Devil Girl from Mars, which is featured on the cover, and The Crawling Eye and the various Quatermasses) as well as TV productions; it’s great to see the same level of attention devoted to such relatively unsung material as The Outer Limits (almost every episode is discussed) and Space: 1999. But as an example of his hit or miss approach, Rux calls The Prisoner “the ultimate abduction story” yet devotes only a paragraph of bare production facts, as if he were only writing an A-Z of TV shows. And that then is really the main problem: does Mr. Rux know what he wants to do here, what he wants to give us? The poorly produced brick of a book is the wrong format. Now, almost twenty years later, one can see what would have been a better way, perhaps; Mr. Rux could have scaled back his ambitions a bit and simply given us a series of concise, accurately detailed online articles or blog posts, not unlike those of Miles Mathis or Vigilant Citizen, with appropriate media links. 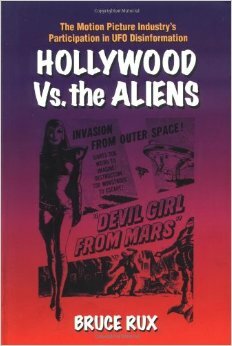 As it is, it’s cheap enough on Amazon, and highly recommended for its history of the alien abduction mythos, and for its hugely browse-able history of Hollywood’s war with the Aliens. 1. “The most merciful thing in the world, I think, is the inability of the human mind to correlate all its contents.” — H. P. Lovecraft, “The Call of Cthulhu” (1926). 2. Hillary herself, of course, thinks she should have been elected in 2008, continuing the bush/Clinton trend uninterrupted, with the Republican insiders initially backing, of course, Jeb Bush. 3. For example, Dave McGowan’s Weird Scenes Inside the Canyon: Laurel Canyon, Covert Ops & the Dark Heart of the Hippie Dream, which I reviewed in “Allen Dulles’ Lonely Hearts Club Band: The CIA & the Construction of the Sixties Counter-Culture,” here . 4. For more on Wood and the Medved Cult, see my “From Bozo to Bertolucci: How Not to Watch the Films of Ed Wood, Jr.,” here . Another Medved/neocon touch is an odd anti-anti-smoking stance, where opposition to smoking is seen as evidence of some kind of government mind-control program, in films and real life; strange to see in a book published by a New Age house. 6. One imagines Ed Wood taking counsel not from Orson Welles but from Cigarette-smoking Man, and then one realizes that the not-dissimilar looking Baptist backer of Plan Nine is played (in the Tim Burton film) by the guy who played the crooked Senator in Godfather II and the “Army brass” that gives Capt. Willard his assignment in Apocalypse Now; he also appeared in such TV series as Space and The Greatest American Hero, the later a subject of Rux’s analysis. 8. For more on Wood as a conservative, indeed Traditionalist, filmmaker, see my “Getting Wood: Closely Watching the Cinematic Alchemy of Edward D. Wood, Jr.,” here . 9. Eros: “You see!? You see!? Your stupid minds! Stupid! Stupid!” Plan Nine from Outer Space (Ed Wood, 1959). 10. Dr. Vorloff: “I have proven that I am all right!” Bride of the Monster (Ed Wood, 1956). 11. For more on the method, see the Introduction to Green Nazis in Space! (San Francisco: Counter-Currents, 2016). 12. For my own list, see “Essential Films … & Others,” here . 13. For example, the opening song clearly promises that we’ll “see androids fighting/Brad and Janet,” but no such androids appear; until you realize that Riff Raff and Magenta, at the end of the film, are not just “space invaders” but, in fact, androids, or robots, as are (Rux emphasizes throughout) the Greys and other “aliens” reported by the visited and abducted. 14. For the 3d picture metaphor, see Ann Sterzinger’s review of my latest collection, “Fashy Homos and Green Nazis in Space,” here . Some have reported a similar shift from “This is absurd” to “Obviously!” on reading my correlation of Mr. Belvedere and Krishna in “The Babysitting Bachelor as Aryan Avatar: Clifton Webb in Sitting Pretty, Part 2,” here . 15. And thus also to the Green Lantern Corps, discussed in the title essay of my new collection, Green Nazis in Space! (ibid). The “sweet transvestite” is, of course, the Divine Androgyne which Evola discusses in The Hermetic Tradition as well as the “Serpentine Wisdom” article in his Introduction to Magic: “How disheartening to those who uphold the myth of manhood based on muscles and metallic strength: this alone is the true man, the absolute man! He absorbs within himself the ambiguous virtue of the female. Lao-tzu talks about the invisible magic of the feminine, which in a feline fashion attracts and absorbs in itself man’s action . . .” See my “Accommodate This! Bruce Jenner & the Hermetic Rebis,” here . The RKO Radio icon is the Tower or Tree of Paradise, the swimming pool is the Lower Waters of phenomena existence as discussed by Evola in both works as well. 16. Nicely complemented by the late Alisdair Clarke’s “The Play of Aryan Archetypes in Space: 1999,” here . 17. Instead, you can read Collin Cleary’s essay here  and in his Summoning the Gods: Essays on Paganism in a God-Forsaken World , ed. Greg Johnson (San Francisco: Counter-Currents, 2011). 18. Like this , perhaps.